Larry Krasner Philadelphia District Attorney, left, listens to Anthony Voci, Interim Chief of Homicide Unit, during a news conference to discuss changes in the prosecutors’ office. 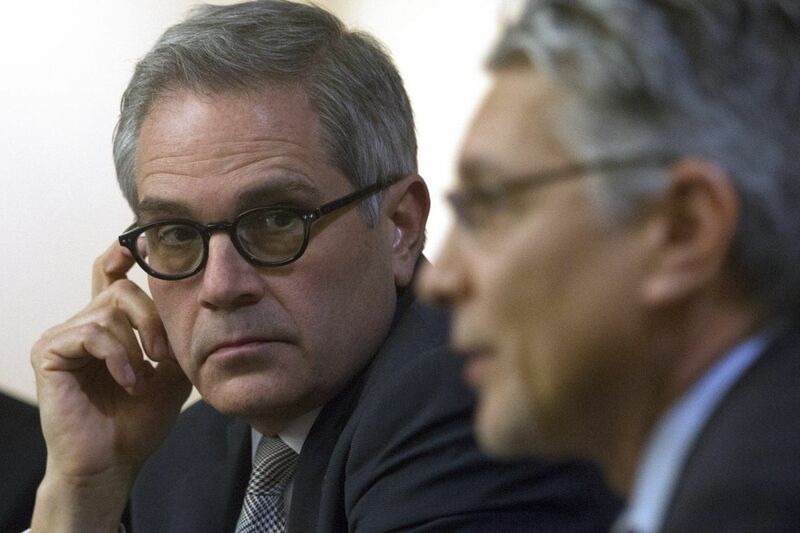 New Philadelphia District Attorney Larry Krasner explained his decision Tuesday to oust dozens of staffers last week, saying many didn't fit in with the reform-driven mission he envisions for the office. Krasner acknowledged that wasn't the only consideration in forcing the departures of 31 staffers, a move that rippled through the courthouse. And though he insisted he didn't "fire" anyone – each was asked to submit a resignation – the city's top prosecutor also noted that he won the right to make such personnel decisions when he earned convincing victories in the Democratic primary and general election. "The coach gets to pick the team," Krasner said. The new district attorney's comments came as he met with reporters for his first public interview since being sworn in a week ago and the tumultuous purge Friday. He also introduced members of the leadership team he is installing at the 600-person office, and said he wants to make the office less hierarchical, more connected to the community, and more focused on goals he expressed during the campaign, such as reducing incarceration and seeking to end cash bail. The new hires introduced at a news conference in his office included new chief of staff Arun Prabakharan; Nancy Winkelman, interim supervisor of the law department; Mike Lee, interim director of legislation; Movita Johnson-Harrell, interim supervisor of victim services; and Anthony Voci Jr., interim chief of the homicide unit. Prabakharan was most recently at the Urban Affairs Coalition. Winkelman was in private practice with a focus on appellate matters. Lee was active in training lawyers and helping defendants get criminal records expunged. Johnson-Harrell ran an antiviolence foundation in the name of her murdered son. Voci, a criminal defense attorney, previously worked in the homicide unit. He starts Friday. Most of those supervisors are considered interim, Krasner said, because employees and managers throughout the office may regularly trade places in an effort to prevent managers from becoming "out of touch with the daily activities and challenges" of those they oversee. He also said more hires would be announced in the coming weeks as certain applicants officially left old jobs or moved to Philadelphia from other cities. Among the appointments to be named is Krasner's first deputy, the top legal aide often considered a key supervisor in any prosecutor's office. Last week's shakeup and the new appointments added to the impression – and in some corners, hope – that Krasner, a career civil rights lawyer, would drastically reshape the office and its priorities. As a candidate, he cited, among other things, a desire to reduce the number of people behind bars, halt death-penalty prosecutions, and end the use of civil asset forfeiture. He reiterated those goals Tuesday. And while he declined to get into specifics about which individuals were forced out or why, Krasner said he ordered detailed reviews to determine which prosecutors would best fit into the new environment he wants to create. "We ultimately concluded that these individuals were not consistent with the mission," he said. The vetting process was based on feedback from other prosecutors, defense attorneys, judges, and even a review of transcripts in particular cases, Krasner said. It led not only to forced departures, he said, but also to reassignments or promotions, though he declined to say who was being bumped up. Krasner acknowledged that his personal impressions of prosecutors, developed during a 30-year career as a defense attorney, played a role in evaluating who stays and who goes. But he said: "There is not one instance in which a person was asked to resign based on my personal experience alone, no matter how ridiculous that attorney's conduct was in a case." Personal connections appeared to play at least some role in his most recent appointments as well. Voci was cocounsel with Krasner in a high-profile triple murder case in 2016 in which the defendants were found guilty and sentenced to life in prison. And Winkelman, a partner at the Schnader law firm, said she reached out to Krasner after his victory to express her desire to help change the criminal justice system. Krasner said he understood that some employees – and even crime victims – may have felt disoriented after a hectic first week of developments. But he said he was confident that the office was moving in the right direction – and that others in the office agreed. "There is actually quite a bit of enthusiasm within the office itself," he said.